A diver uses a metal rod to support himself so that he doesn’t touch the reef – or anything on it. IN SCUBA-DIVING, as in every sphere of human activity, conventions arise over time that govern the behaviour of the participants. These may not necessarily be set in stone or legally required and enforced. Sometimes they just become established and generally accepted over time. Often they differ from country to country. This is part one of a three-part series that covers a variety of scuba-diving situations in which certain forms of etiquette exist. Not everyone will agree with my recommendations, and I’m sure the more experienced among you will have your own particular opinions and bugbears. But that’s all part of the fun. The convention is to look, don’t touch! This doesn’t apply only to big animals such as turtles, manta rays and whale sharks but to the smaller ones too. In fact, you could argue that the smaller the animal, the more vulnerable it is and the more reason to leave it alone. 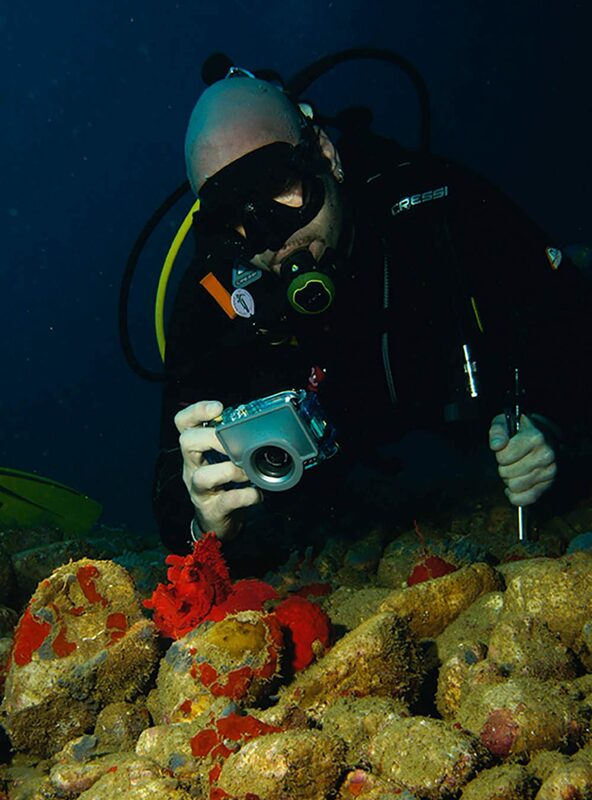 Some operators prohibit their divers from wearing gloves in an effort to discourage them from laying their hands on the reef and its occupants. There is much debate over whether a glove ban works, and it’s an issue that can arouse strong feelings. I believe that educating divers is more effective than imposing rules. I don’t think that most of the people who wear gloves do so because they want to interfere with the marine life. Gloves can make you feel more comfortable, or help to keep you warmer. Nor do I believe that someone who wants to disturb the animals is going to be dissuaded if they have to do it with bare hands. However, good etiquette also requires that if you want to dive with an operation, you abide by its rules. If a dive-centre has a no-gloves rule and you want to wear gloves, choose another dive-centre. But, whatever your preference, don’t touch the animals. The issue of when to tip and how much to tip causes a great deal of anxiety, especially on dive-boats when there is a mix of nationalities on board. Although some dive operations try to establish a tipping convention and suggest that a certain percentage is “normal,” there is actually no established etiquette for tipping in the dive industry, just as there is no worldwide agreement on the culture of tipping. Some people tip heavily, some tip a little, some do not tip at all. No matter how attractive their lifestyle seems, dive-industry employees do work long hours and are not well-paid. So tips are much appreciated. Most dive operations do not add an automatic service charge to the bill. Like many restaurants, dive-operators often prefer that you place your tip in a gratuities box so that it can be shared out among everyone, including backroom staff such as technicians and office workers, who you probably won’t have met but who contributed just as much to the experience you enjoyed as the “front of house” staff such as divemasters and instructors. However, if your trip was enhanced considerably by the performance of one or more specific individuals, then you should not feel at all awkward at giving them a personal gratuity. It’s then up to them if they choose to add it to the general tip pool or otherwise. Regarding how much to tip, the best advice I can give is this: don’t fret about doing the right thing or causing offence. Neither should you concern yourself about what others in your group are doing. Tips should be a personal decision. I usually advise those who ask me to tip dive-industry employees the sort of percentage they’d pay for good service at a restaurant back home, adding more if they feel the service was extraordinary. There are laws and seasons governing spearfishing and hunting for food in many places. Some are very strict, but others are surprisingly relaxed in these environmentally aware times. Be sporting; freedive instead of using scuba when you spear fish, and don’t spear them at night using an artificial light source. Don’t use a speargun when other divers are nearby. Don’t hunt in areas where fish are used to interacting with divers. Don’t hunt in places where people feed fish to attract divers. Take only what you can eat and eat everything you take. 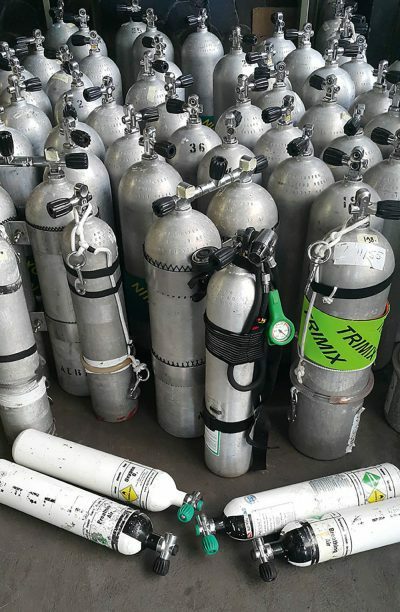 It is an established convention that an item of dive-equipment found under water should be returned to its rightful owner. To benefit from this community-friendly piece of etiquette, make sure to tape your email address or phone number to anything you think you might drop in the ocean, such as your mask, camera, torch or dive-computer. If you come across something that someone has been lost, make every effort to locate the owner. After all, what goes around comes around! In many areas of human interaction, a common bonding mechanism is the shared use of references, a code used by members of the group to identify each other and separate them from outsiders. In the military, this often manifests itself with the use of acronyms that are incomprehensible to the uninitiated. On the London criminal scene in the 19th century, the code they used to conceal their activities from police-informers is now known as Cockney rhyming slang. In scuba-diving we’re often guilty of doing the same. We insist that “real” divers refer to fins rather than flippers and cylinders rather than tanks. But, does it really matter? In the next part of this series I will look at more aspects of etiquette, including dive-boats, entry and exit and mask snot!